I am back in Cambodia for the winter. 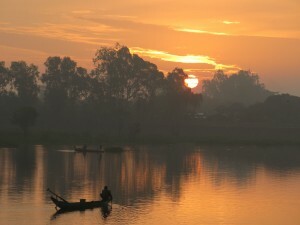 Here is a photo I took off my deck overlooking the Mekong River south of Phnom Penh at about 6 a.m. on a recent morning. The village where I live comes to life around 5:30 each morning – local monks chanting, roosters crowing. I am often up at 4 or 5 doing phone calls with the U.S., where it is 12-15 hours earlier, depending on time zone .